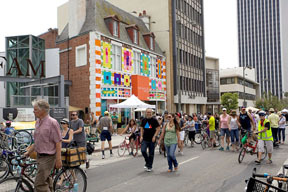 PEDESTRIANS join cyclists at a recent CicLAvia car-free fest on Miracle Mile’s Museum Row. An art walk, bike-related crafts and a festive good time are in store for all when CicLAvia rides into town. The part-party, part-bike fest, pedestrian friendly event returns to the Miracle Mile on Sun., April 6 from 9 a.m. to 4 p.m. “Iconic Wilshire Boulevard” starts at One Wilshire in downtown Los Angeles and cycles through Museum Row ending at Fairfax Ave.—at the future site of the Academy of Motion Picture Arts and Sciences. The home of the Oscar will provide a photo opportunity: a backdrop featuring giant movie stills from famous bike scenes in film history. More bike-related events will be offered at LACMA, the Craft and Folk Art Museum and the Petersen Automotive Museum. The Mid City West Community Council will also hold its Art Walk and galleries will be open during the event. Pop music and photo cut- outs will stand in front of the Berlin Wall segment at Wende Museum, 5900 Wilshire. Wilshire Boulevard Temple will open its doors to show off the newly renovated sanctuary and will offer guided tours. Leave the car in the garage and hop on a bus, ride a bike, skateboard or stroll along the Boulevard to take part and join an expected 100,000 Angelenos when CicLAvia returns to the Mile. This will be the last Wilshire Boulevard route until the completion of construction of the Metro Purple Line subway extension through the Miracle Mile. Learn about Art Deco and other architectural styles of the area listening to a podcast by researcher and commentator Edward Lifson. A pocket walking guide written by Catherine Gudis will also be available. “Iconic Wilshire Boulevard” coincides with national Open Streets Summit, April 4-6, which brings leaders in urban planning, alternative transportation and bike and pedestrian advocacy to consider new opportunities. Car-free anchor hubs—pedestrian-only zones with cultural programming, food trucks and rest stops—will be at One Wilshire, MacArthur Park, Koreatown (at Western Blvd. ), Mid-Wilshire (at Rimpau Blvd.) and Fairfax. Drivers beware: cars can only cross Wilshire at La Brea, Western, Vermont and Alvarado during the event. Sponsors include The Ratkovich Co., Miracle Mile. Visit ciclavia.org. Tags: cicLAvia, Iconic Wilshire Blvd.